Undoubtedly, she is one racqueteer whom India can be justifiably proud of. In the last few weeks, she has – soon after bagging the India Open Grand Prix 2010, the Singapore Open Super Series and the Indonesia Open Super Series titles in three successive wins in June – catapulted to the World No 3 position. Reaching a new high, the ace shuttler caught the collective imagination of not just her hometown, Hyderabad, but of the country as well. And in July, with 64791.2637 ranking points, she galloped one rank upwards, second only to World No 1 Yihan Wang. Saina Nehwal marks an exclusive day with Verve in her calendar, which has us winging out from Mumbai to the City of Pearls. Leaving Hyderabad’s swanky airport behind us, we zip swiftly across the longest flyover in the country to reach the Taj Krishna, where we’ve asked the just-out-of-her-teens sensation to meet us. At the appointed hour, I wait for her amidst the footfalls in the lobby, as the rest of the team readies itself in the Qutub Shahi suite on the seventh floor. “I am a few minutes away,” Saina messages and soon, I spot her stop by the security for the mandatory check that is purely perfunctory for her. The sports star picks up her purse and walks in unattended as faces turn to take a second look at her. Gone is the ‘Who is that girl?’ phase – she has moved out of the sidelines to take her rightful place in the spotlight. As Nirali, our stylist, beckons her into the room to show her an array of outfits laid out for the shoot, she takes the relatively new experience in her stride – trying on one after the other so that she can sport what suits her best. Interestingly, she hardly turns around to catch a glimpse of her quicksilver changes, smiling even as she navigates her way through an unfamiliar top. Her sunshine temperament is what holds her in good stead in her game too. “Even if I lose my temper and shout sometimes, I will never hurl my racquet or break it. I play with it and have given my life to it. I do not have an attitude that makes me do all that. I have seen Sachin Tendulkar and Roger Federer playing; they are all so cool. I don’t get angry. If I lose my temper at home, perhaps when Mom cooks food I do not like, they laugh at me. They say I don’t know how to get angry. I am normally quiet and I listen to everyone,” Saina remarks. Planning seems to have been her middle name from the day she picked up the racquet, having watched her parents playing the sport. Her foray into the world of badminton was inspired by her father, Dr Harvir Singh, a scientist at the Directorate of Oilseeds Research, Hyderabad and her mother, Usha Nehwal, both of whom have been former state badminton champions of Haryana. In December 1998, Saina’s father took her to meet Coach Nani Prasad at the Lal Bahadur Stadium, Hyderabad. The coach saw a spark in her and encouraged her to enrol as a summer trainee. And Indian badminton history began to be re-written. And yet, even in a crowd, she is alone. “It is tough to make time for friends,” she states. “I am not in touch with anyone. Now that you mention it, yes, I am lonely. As players, we do miss friends but we don’t realise it at that time. When I stop playing, I may feel their absence. But I am used to playing alone; sometimes without coaches or companions. One loss that the first Indian woman to reach the singles quarter-finals at the Beijing 2008 Olympics will never forget is that defeat. “I do not normally break down on court. I know I have chances of coming back into the game till I am match point down. I loved the stadium so much that I did not want to leave it. I was so sad after that loss. Olympics do not happen every year. But I am now looking forward to winning the gold in London,” she says. There are three important tournaments on the anvil this year – the World Championships, the Commonwealth Games and the Asian Games. “Winning three tournaments is not easy. People imagine that I will stroll into the No 1 position. I will be happy if I win tournaments. 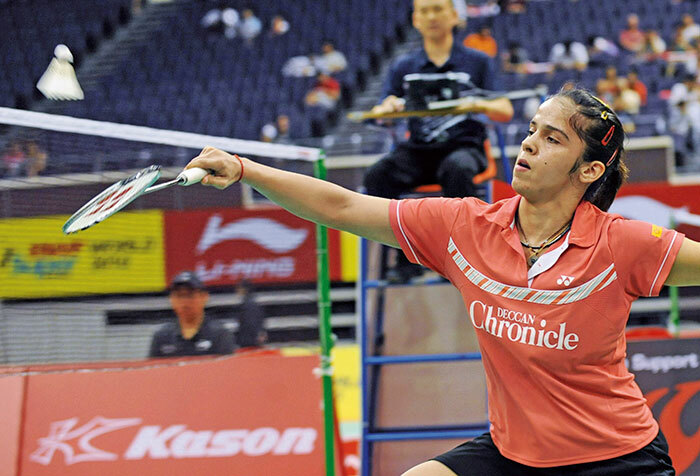 The ranking will automatically come,” Saina states confidently. Three titles in a month, two of them in A-list events. For a nation so starved of sporting success that it has a distended belly, Saina Nehwal’s recent achievements could cause indigestion. Forget the cricketers and the No 1 ranking in a sport that less than half a dozen nations take seriously. Think instead of a girl who used to do 50 km round-trips from the age of eight – waking up at 4 am – so that she could excel in a country where sport is watched rather than played. Like Prakash Padukone, whose own purple patch 30 years ago took in the Danish and Swedish Opens and the All England title, Saina was lucky to be born into a family with a sporting tradition. When she became the first Indian woman to win a tournament of note in the Phillippines in 2006, she was only 16. Aparna Popat had dominated badminton in India for nearly a decade, but found glory far harder to come by once she crossed passport control. Saina is currently the only non-Chinese player in the top five, and has shown signs of being able to mix it with the very best. In the semi-finals in Singapore, she was hammered in the first game by Lu Lan, world champion last year, before coming back to win in convincing fashion. Off the court, she’s both personable and marketable, though she hasn’t captured the imagination quite like her near-namesake, Sania Mirza, did during her brief flirtation with the higher echelons of women’s tennis. It’s perhaps Saina’s good fortune that she plays a less high-profile sport, one where she’s less likely to be tripped by fame and fortune. Over a quarter century has passed since PT Usha crossed the finish line one-hundredth of a second behind Cristeana Cojocaru at the Memorial Coliseum in Los Angeles. That remains the benchmark for Indian women that take to sport. At least now, there appears to be someone ready to grasp the standard and head off into unknown and exciting territory.